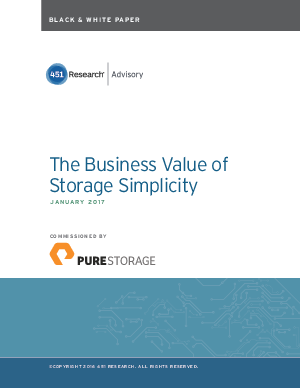 In July 2016, Pure Storage commissioned an independent study, conducted by 451 Research, that surveyed 253 enterprise IT decision-makers responsible for storage technology decisions in order to quantify the business impact that Tier 1 storage had on organizations. In the study, we found that a majority of the companies surveyed (52% of respondents) had to cancel IT projects due to problems associated with their Tier 1 SAN-based storage arrays. IT organizations that were impacted by poor performance faced a number of key issues, including customer loss, transaction loss and damage to their organization’s reputation. Disruption for organizations came from a number of sources, including time-consuming array maintenance and tuning, disruptive hardware upgrades and slow provisioning. Interviews also revealed that performance and reliability issues created strained relationships with business stakeholders.